Singing in a choir can be a lot of fun. And, it’s a great place to pick up some valuable skills as a singer, such as sight-reading, singing in a group or harmonizing with others. But finding a choir to join can be a little challenging. 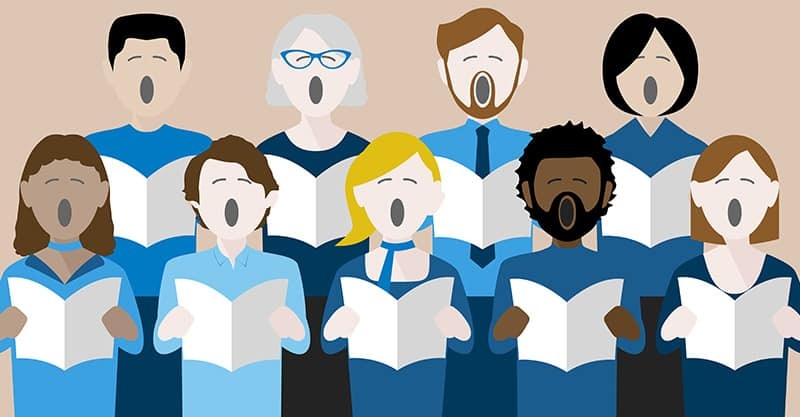 There are many choirs that are associated with schools, churches, clubs, communities and organizations that – unfortunately – you may not be able to join unless you’re a student, member or employee. That’s not so bad. But what might take a little more effort is finding a choir that’s singing the kind of music you want to be singing. Finding the right fit is just as important as finding choirs that are willing to have you join. But no matter what you’re looking for in a choir, here are several ways you can find a good choir to join. 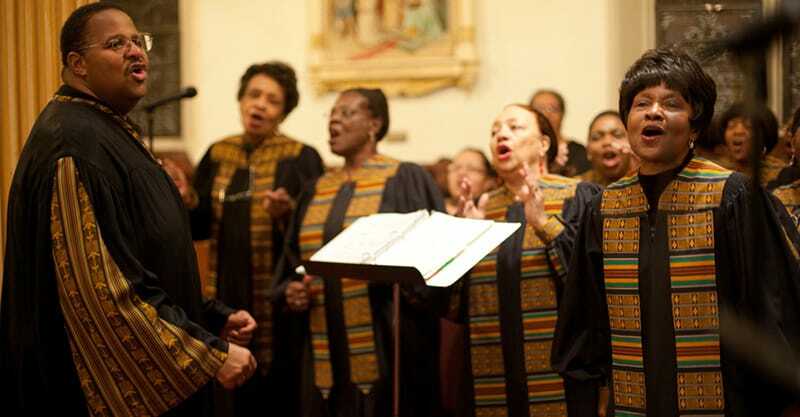 Today, choirs exist in a variety of flavors. There isn’t necessarily a catch-all solution. So, being specific about what you want might help you find what you’re looking for sooner. Are you willing/able to commute and travel? 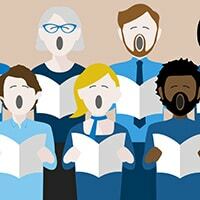 Would you prefer it if choir practices/rehearsals were closer to home, or are you okay with commuting? Is it okay if performances are in a variety of locations? What times works for you? Can you commit to weekly practice or more? Are you able to leave or make time in your schedule for performances, which often happen on weekends? What type of music do you prefer to sing? Do you already have some singing experience? Is your previous experience an asset to the choir you’re thinking about joining? Does the choir you’re interested in joining require anything of you? Are they looking for people with a certain level of experience or education? 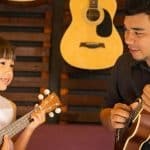 Are you expected to have a good grasp of music theory or other relevant knowledge? Are your values in alignment with the choir’s? Does it seem like the right fit for you? Do you like their vibe and/or atmosphere? Do your personal beliefs match theirs? Are you generally a positive and optimistic person? Do you like working with others? Are you a team player? I’m not sure about your locality, but in general there are a lot of choirs out there. So, narrowing your options is a good idea. Your answers to the above questions should help you with this process. 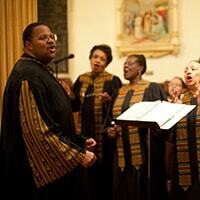 Now, here are some specifics on how you can find a choir that’s right for you. In Calgary, where I live, we have something called Cool Choir. Its members are made up of a variety of people, as there is no singing experience required to be a part of it. What’s unique about it is that they sing many popular adult rock and pop songs, making it more accessible for the general population. When I Google “join choir near me”, Cool Choir is one of the first results that comes up. I’m not looking to join a choir myself, but if I was, I’d think Cool Choir would be a good option for me. I’m not sure what would turn up for you if you searched for “join choir near me”. It depends on where you live, but you’ll probably see a mix of results – community choirs, children and youth choirs, choir Meetups, pop and rock choirs and so on. And, by the way, Meetup is not a bad place to find people with common interests. So, if you seem to be stuck at a dead end, you might check out the Meetup website for likeminded people. If nothing else, searching on Google should give you a few leads. And, that’s all you need to begin sending out emails, making phone calls or finding other places to look. Google may be the world’s biggest search engine, but social media is also a great place to look for opportunities. On Facebook, you’re probably connected with a lot of people, and they may have mentioned something related to choirs in one of their posts recently. Maybe some of your friends are part of choirs. Additionally, just searching for “choir” should direct you to a few relevant pages. On YouTube, you can check out videos of the types of choirs that are performing in your locality. And, this can be a great way to figure out whether there might be a good fit for you too. Likewise, Twitter and LinkedIn can also make for decent search engines as you seek out connections and opportunities. You might be surprised by how many of your friends already sing in choirs or know choirs you could potentially be a part of. So, don’t be afraid to reach out. You could simply post to your Facebook profile and ask in a more general way (i.e. “do I know anyone that’s part of a choir?” or “if I were interested in joining a choir, which one would you recommend?”). Or, you could direct message friends, catch up with them and see if they’re aware of any opportunities. Even if they don’t, connecting with people is always a good idea as they might come across something worth mentioning later. And, don’t forget about that handy device you keep in your pocket. Everybody has a contact list on their smartphone, however big or small. Don’t be afraid to utilize it, as you never know who might be able to help you out. Classified ads kind of give off that “cheap” vibe. But I’ve found that you can still find quality products, services and connections through them if you’re willing to look. Many years ago, when I was looking to grow my income from music, I started scanning the classified ads regularly. One day I came across a promising ad. It said they were looking for a professional level “rock star” who was interested in playing paying gigs. As it turns out, the person on the other end of the ad was already an acquaintance of mine. I ended up joining his Def Leppard tribute band, and since then I’ve made several thousand dollars with him. That may not be anything to write home about, but it’s nothing to sneeze at either. Sure, you might come across some people who aren’t all that serious, or you might end up finding ads for choirs that no longer exist. But that’s partly what makes scanning the classifieds so fun. Just go through the numbers. No big deal. Check out sites like Craigslist and Kijiji for potential opportunities. If you live in a decent sized city, there should be a few local entertainment magazines you can check out. Many publications are moving online these days, so if that’s the case in your locality, then look around online instead of checking the paper racks. Sometimes, there will be ads promoting local groups looking for members. Sometimes, there will also be classifieds. There may also be ads for choir performances. But if you can’t find any of these, don’t worry. Just see if any local choirs have received coverage in the magazine. If so, make note of them and Google them later. There may be an opportunity to join. And, if you’re desperate. See if you can find contact information for the magazine in question. Get in touch with them directly and ask if they know any choirs that are looking for members. Depending on where you live, you may be able to find a choir directory that lists many of the choirs that exist in your area. Sure, there are some forward-thinking choirs that have a proper web presence and a Google Maps listing. But for every choir that is on top of the latest tech, there are probably 10 others (or even more) that aren’t. You shouldn’t expect to be able to find every choir on Google. So, directories (online and off) are a good place to look. There are also several websites like ChoirPlace that allow you to search by country, voices, choir types and genres. If you’re doing some deep digging, these are worth checking. Assuming you’re in a decently well-populated area, you’re probably not going to exhaust your list of choirs in a hurry. Finding the right one could be time consuming, but just keep at it. Now, it might seem odd to contact radio stations in search of a choir. But here’s the thing – many of them are connected to communities, churches, universities and the like (and, likewise, these communities and schools might be able to point you in the right direction if you get in touch with them). That means they may have contacts they can introduce you to. And, when you think about it, there are probably plenty of radio stations that have promoted events that featured choirs. Even if it was just an ad, they’ve probably dealt with choirs on some level. So, in some instances radio stations could end up being valuable resources to turn to. If you’ve exhausted all other options, or if you think a certain radio station might prove to be a good lead, give it a shot. Let’s say you can’t find a choir in your locality, there’s none that will let you join, or you can’t find one that’s right for you. Well, if you’re particularly ambitious, and you’re determined to join a choir no matter what, you could always start your own. There are many ways to go about this process and there isn’t necessarily a right one. For instance, you could start a Meetup group and begin promoting it. You could post a classified or Facebook ad. Maybe you could start a website or a few social media profiles to begin attracting members. Or, if there are a few people in your social circles that are interested in singing like you are, together you could form the foundation of the choir and begin reaching out individually to see who else might be interested in joining. 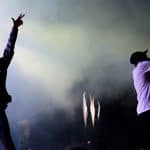 Basing it on common interests is a good idea since that’s probably the first thing people are going to be attracted to – a specific genre of music or singing style. Additionally, starting your own choir would certainly give you more control over branding, values, practice and rehearsal sessions, performances, musical direction and arrangements. This could either be a blessing or a curse depending on how much work you want to do. Don’t worry, though – you could always have other people help you or take over certain tasks. Starting a choir probably isn’t for the faint of heart. There are a lot of details you’re going to need to figure out. Music is just one aspect of it. You’re going to need to be able to communicate and deal with people effectively, make decisions that are right for the group, organize rehearsals and performances, and a great deal more. So, if this is the direction you’ve chosen for yourself, don’t fear the act of asking for help. You could probably use it. If you’ve gone through the above steps, I can’t imagine you haven’t at least found some worthy prospects. Keep in mind that you may need to make some compromises. There is no such thing as a perfect choir, just as there is no perfect church, school or community. But there are good ones out there, and you should be able to find one that’s at least a relatively good fit. Your desire to sing should outweigh your desire to find the perfect place, as any experience you gain can prove beneficial in the future and can lead to more opportunities for you. Most of all, don’t forget to have fun and keep a positive attitude. That will make the process of finding the right choir more enjoyable, and it’s the same enthusiasm you should carry into whatever choir environment you find yourself in.